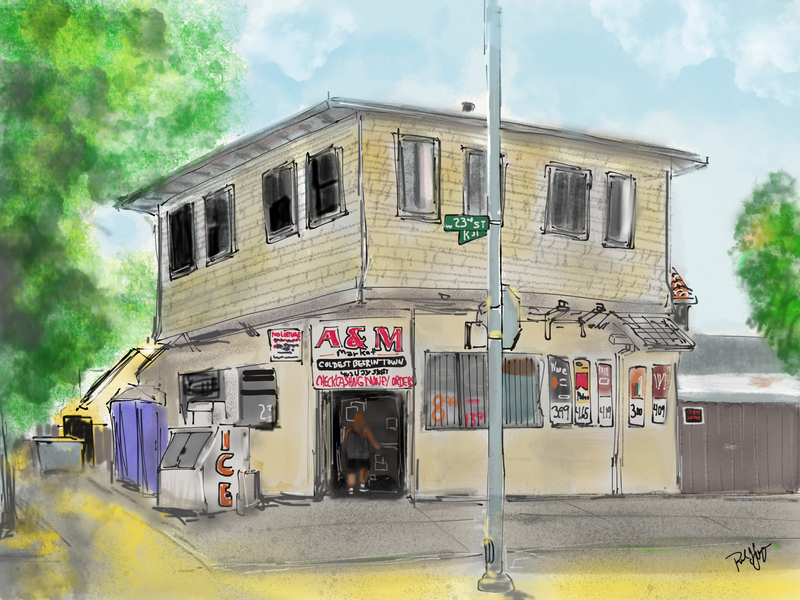 I pass this little corner market at the corner of K and 23rd, not to mention the nearby train station and the old Ford pickup truck, on my way to and from the 17th Street Pub. Technical: I snapped a photo of this using my iPhone, viewed it in iPhoto on my external monitor, hand held my iPad and began sketching free hand in Paper 53 and finished it in Procreate. Good practice. This entry was posted in Digital Artwork, iPad Art, Sketches and tagged 17th Street Public House, 17thstreetpub, Corner Stores, Fifty Three Paper, Merced California, Paper 53, Procreate, Route by portfoliolongo.com. Bookmark the permalink. A&M Market Merced: This is number 1 of my “plus four” picks.